Although some Moroccans are minimalists when it comes to food shopping, buying only what they need for a day or two, many homes are indeed well-stocked with a variety of ingredients which are not only considered essential to Moroccan cooking but may be turned to for inspiration when planning a last-minute meal. This list will give you an idea of what to have on hand in your own home if you plan to cook Moroccan recipes with any regularity. Only a handful of spices are necessary to make mouth-watering tagines, but the variety of spices used in Moroccan cuisine is actually quite extensive. This list highlights the spices you'll encounter most frequently in recipes. This complex spice blend lends exotic flavor and aroma is essential to a number of Moroccan dishes, but it may also be added according to personal taste to tagines, vegetable dishes, meat marinades, and rubs. 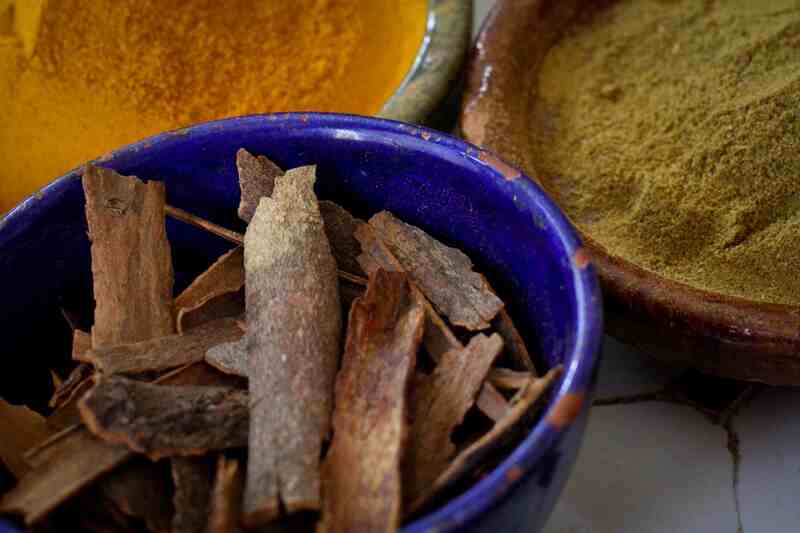 Recipes with Ras el Hanout call for the fragrant spice mix. Saffron, often touted as the world's most expensive spice, imparts a distinctive aroma, delicate flavor and lovely yellow color to the dishes to which it is added. Morocco cultivates its own saffron in the Taliouine region situated between Agadir and Ouarzazate. In Moroccan cooking, you'll most often encounter saffron in main dishes, but it also shows up in such unexpected preparations as Moroccan saffron tea, semolina soup and a fried sesame cookie called chebakia. Onions, garlic, parsley, and cilantro are the herbs utilized most in everyday Moroccan cooking, while na'na (spearmint) is used in equally robust quantities to flavor tea. Some other popular aromatic plants used in Moroccan homes, either to flavor teas or to benefit from their medicinal and therapeutic properties, are listed below. Tangy and salty, preserved lemons add a distinctive lemon flavor to a variety of Moroccan dishes. They're readily available in Morocco, but you may have a bit of trouble tracking them down elsewhere. Fortunately, making your own preserved lemons is quite easy to do and requires only fresh lemons and kosher salt. Allow the lemons to cure for at least a month before using. Olives of all kinds are served as condiments, garnishes or used in cooking. Red and green olives are the varieties you're most likely to encounter in tagine recipes; one such dish is the popular chicken tagine with preserved lemon and olives. In Moroccan kitchens, golden, unhulled sesame seeds are favored over their whiter, hulled counterparts. The seeds are used to garnish a variety of dishes and lend nutty flavor and texture to bread and other baked goods. They're also a key ingredient to such sweets as sellou and ghoribas with sesame. Like sesame, almonds are used in Moroccan cuisine as both a garnish and key ingredient. Many recipes require that the almonds be blanched and peeled (and sometimes fried) before they're ready for use. They show up in a variety of Moroccan sweets, including the popular almond briouats and kaab el ghazal, and appear in a simpler form as a roasted almond snack or almond milk shake. The photo shows olive oil, pressed from Morocco's indigenous olives, being added to grated tomatoes to prepare a classic kefta mkaouara (meatball) tagine. Moroccan pantries typically have ample supplies of olive oil and vegetable oil, both of which are used liberally in cooking. In addition to its cooking use, olive oil may also be served plain as a condiment with bread, or as a garnish to drizzle over cooked salads such as zaalouk or bean purees such as bessara. Many Moroccan homes have a bottle of argan oil in the cupboard. This oil, which is unique to Morocco, has a light, nutty flavor and aroma. It's delicious served alone with bread, added to dishes such as lamb tagine with olives, and is famously used to make a delightful dip and spread called amlou. The value of flour in Moroccan cannot be overstated, as it is utilized in great quantities by bakeries and home cooks to prepare Morocco's requisite daily bread. Bread is the staple upon which most meals are based, and it is either purchased or made fresh at least once daily. In a culture that prefers to eat by hand rather than by utensil, it is used in place of a fork to scoop up tagines, meat, poultry, vegetables, eggs, dips, salads, and sauces. Bread is also used to make sandwiches of all kinds, as well as crepes, rghaif, cakes, cookies and other sweets. While white all-purpose flour may, therefore, be the most versatile flour in Moroccan kitchens, other grains are also highly valued. Wheat grain is used in Moroccan cooking in a number of forms, most often as the whole wheat flour which so many Moroccan cooks regard as essential to their daily baking of Moroccan bread (khobz). Wheat berries cracked wheat, and bulgur are also used in such dishes as whole wheat couscous, dchicha soup and ​hergma. Both fine and coarse semolina are found in Moroccan home kitchens, where they are used not only to make Morocco's famous couscous but also to make flavorful bread, sweets, crepes, fried pancakes and even porridge-like soups. Moroccan recipes with semolina use this sandy-textured flour from durum wheat Also see the glossary listing for Durum Flour, which is an even fine-textured flour than semolina. Barley is another grain which is commonly used in Moroccan cooking and baking. Examples of recipes which call for it are couscous belboula, barley soup with milk, cracked barley soup, and barley bread. Couscous is regarded as Morocco's national dish. Once served as a staple in place of bread, it is now a weekly rather than a daily offering in most Moroccan homes. Some of the best-loved preparations are couscous with seven vegetables and couscous tfaya. Although couscous made from semolina is most popular, couscous may also be made from barley, wheat, corn, millet and other seeds and grains. Many Moroccans are quite partial to all things sweet, and that preference is reflected in the fact that Morocco has one of the highest per capita sugar consumption figures in the world. I once had a housekeeper that felt the need to sweeten even her drinking water, although gratefully she has since rid herself of that habit due to health concerns. More Moroccans are following suit, but sugar remains, of course, an essential pantry item for baking, cooking and sweetening both hot and cold beverages. Honey is another popular sweetener in Morocco, where it is used as a condiment, cooking ingredient, and natural medicine. The link here takes you to some recipes which call for honey. In Morocco, it is available in many flavors (this varies according to the type of flowers which the honey bees pollinate) with some of the more popular being za'atar, eucalyptus, and orange blossom. Green tea appears to have been introduced to Morocco less than 200 years ago, but it was quickly adopted into Moroccan culture by the poor, elite and everyone in-between. Many Moroccans drink it several times daily, be it for breakfast, following the main meal, to take a mid-morning or afternoon break, and most importantly, to offer as a matter of protocol and hospitality to guests and unexpected visitors. Although the green tea can be steeped alone, it is far more common to find the tea has been steeped in fresh herbs such as mint, pennyroyal, wild geranium, or lemon verbena. Orange flower water and rose water are both used in Moroccan cooking and baking, sometimes interchangeably, but I'm giving emphasis to orange flower water since I've found it to be the most popular of the two. Our list of Moroccan recipes with orange flower water gives some examples. The fragrant waters are also used to perfume the hands after eating. Khlea (or khlii) is a preserved meat made most often from beef, but also from lamb or camel meat. Although refrigerators have reduced many Moroccans' dependency on preserved meats as dietary staples, khlii is enjoyed with almost delicacy status in many homes. It can be added to egg, bean and vegetable dishes for flavor and nutritional value. In the US, you can buy khlii online. Like khlii, the Moroccan preserved butter known as smen has retained popularity as a much-loved traditional food and essential ingredient. Smen may be enjoyed as butter on bread, but its pungent flavor and aroma are more likely to be appreciated by non-Moroccans when it's added in small quantities to dishes such as chicken rfissa or harira. This fiery condiment was originally Tunisian, but in recent decades Moroccans have made the chili paste part of their own food landscape. You'll find harissa used to flavor marinades, stews, olives, tapenade and more, and offered on the side as a condiment to grilled meats, sandwiches, and tagines. This paper-thin pastry dough is used to make sweet or savory creations such as chicken bastilla, briouats, and kteffa. It's best when very fresh, so Moroccans are inclined to buy it the day it will be used. Outside of Morocco, you can substitute spring roll wrappers or phyllo dough, or try making your own warqa.